WindowCanvas Graphics: turns your window into art! See it from the outside - not from the inside! WindowCanvas rear window graphics feature micro-perforated vinyl which has approximately 30% holes and 70% material. Lighting is what makes the whole thing work: the reflection of light off the image provides the illusion of a solid image. On the inside, the black adhesive side absorbs the light and so that the material is easily seen through. Sizes - we have one that will work for you! Any of our WindowCanvas designs are available in 3 different sizes. 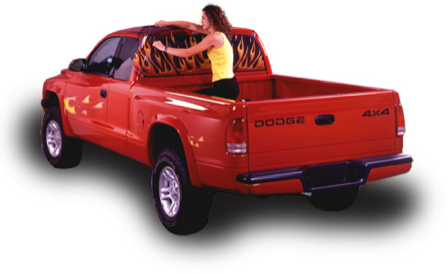 By far, the most popular size is 20" x 65", which fits most standard pickup trucks. 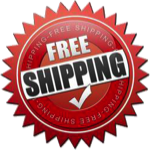 There is also a 16" x 54" size for compact trucks, as well as a 30" x 65" size for SUV's. Keep in mind that the image can be trimmed to fit, so if one of these sizes is just a few inches too big, it should still fit just fine. Plus, the images are designed so that trimming off the edges will not affect the general feel of the design. If, by chance, one of our standard sizes do not fit - we can create the custom size you need! WindowCanvas prints all of our graphics using our large format, state-of-the-art, high-resolution printers. We use only the highest quality perforated vinyl and inks to produce graphics with eye-catching colors and clarity. Since we use only the best materials available, we back all of our graphics with a lifetime warranty. We're a leader - even though our designs are for followers! WindowCanvas is a leader in next-generation personal, artistic expression, boldly declaring your personal ideals using today’s popular “canvas”, cars, trucks and SUV’s. WindowCanvas designs and manufactures a huge selection of see-thru graphic images of wildlife, art, flags, breathtaking scenery, personal life-style imagery and much, much more. Licensed designs from the biggest names! Yes you can - and we can help! Installation is simple & straightforward! Installing a WindowCanvas graphic is a pretty simple process. The perforations in the vinyl prevent the film from getting bubbles in it. ; making the installation easy as 1-2-3. We have detailed instruction sheets and installation videos available here if you need help. Don't see what you need - we can make it! Since all of our designs are printed in-house - we have the ability to customize a unique design just for you. From the simple resize of one of our existing designs to fit your vehicle, to a completely unique work of art that you envision - we can do it. These designs may take an extra day or two to complete, and cost slightly more, but good things come to those who wait! And nothing good is free! Unmatched quality and service - and we back it up! All WindowCanvas graphics are printed and packaged right here in Cincinnati, OH. The best city in all of the United States! All WindowCanvas products feature our Exclusive Lifetime Warranty. Visit our Warranty Information page to learn more. WindowCanvas stock designs are printed and shipped within one business day of ordering. Many even go out the same day. Not happy? We will take it back! Picked a design and realized it isn't for you? Guessed on the size - and got it wrong? If this happens to you, and it is within 30days of ordering - we will take it back - no questions asked.